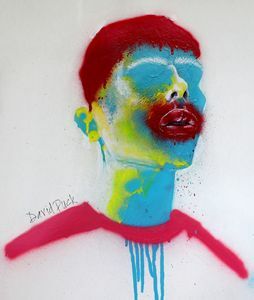 Spray paint, acrylic, original 18"x18". 'Identity' explores concepts of identity and self in the digital age - lips protruding, pose expectant, textured skin, eyes and individuality removed. 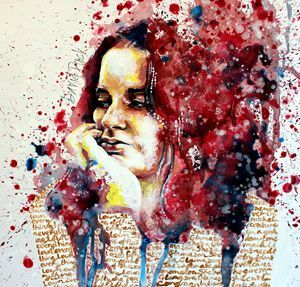 Stylistically it stands out for its dark subject and experimental use of spray paint. 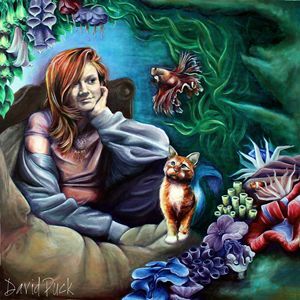 David Puck is an emerging traditional portrait painter, primarily working in spray paint and acrylic. 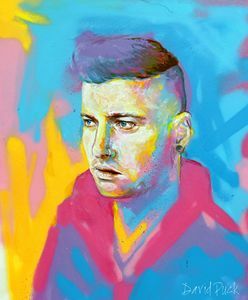 Their work largely focuses on depiction of queer and fringe individuals – through bold colour, energetic mark-making and intricate detail – reflecting questions of individuality, normative culture and identity in the contemporary context. They studied at the renowned University of Oxford, UK. Their work has been featured by international companies such as Buzzfeed, Threadless and Twinings, and in magazines such as Borealis, YellowDot and Leur. Online advocates include Uglyworldwide, Grace Towers and Imp Kid. Collectors include Mayim Bialik (TV’s ‘Blossom’ and ‘Amy’ in The Big Bang Theory). They are based primarily in Berlin, Germany, and divide further time between California, England and travelling. 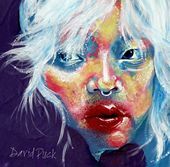 Follow their work on Instagram @davidpuckartist - and get in touch with any further queries or requests.